This lesson will first take you through what a symmetrical triangle chart pattern is and then teach you how to use it to trade. 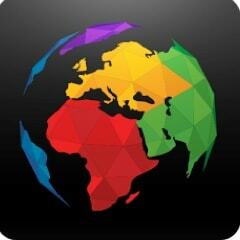 In the following lessons we will then introduce you to ascending and descending triangles. A symmetrical triangle occurs when the price is making lower highs and higher lows. 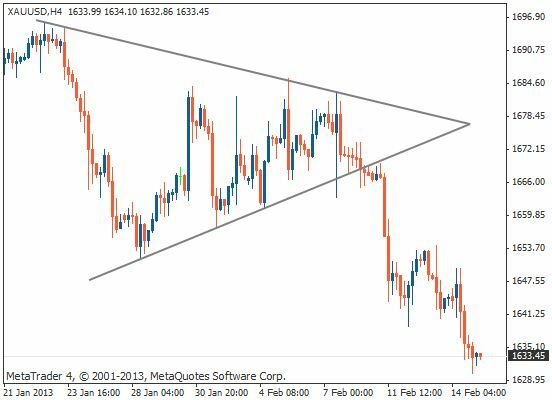 This usually means that neither the buyers nor the sellers are able to gain control, causing the price to range within a triangle. The price usually trades between trend lines which act as support and resistance, preventing the price from breaking through to new highs or lows. The first way to trade a symmetrical triangle is to look for a breakout on either side of the triangle and then trade in the direction of the breakout. Wait for a candle to close above or below the trend line before you look to enter. The stop loss should be placed at the opposite slope of the triangle. When buying, the stop loss would be placed below the bottom slope. When selling, the stop loss would be placed above the top slope. The take profit level is determined by taking the height of the back of the triangle and placing it an equal distance from the trend line breakout. The chart below demonstrates where the entry would be placed. In this case the price broke out to the upside of the triangle. The second way to trade a symmetrical triangle is to wait for the price to break out of the triangle and then come back to retest the slopes of the triangle as either support (in the case of a long trade) or resistance (in the case of a short trade). The stop loss would go either above the resistance level (in the case of a short trade) or below the support level (in the case of a long trade). The profit target is the same as in method two, by measuring the distance of the back of the triangle and placing the profit target the same distance away from the entry. the symmetrical triangle chart pattern indicates a possible breakout in either direction. 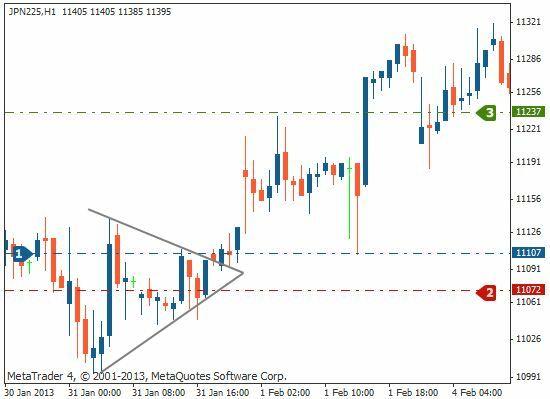 you can trade using a symmetrical triangle by placing a trade when the price breaks through the triangle and trading in the direction of the breakout. The stop loss would go on the opposite side of the triangle. 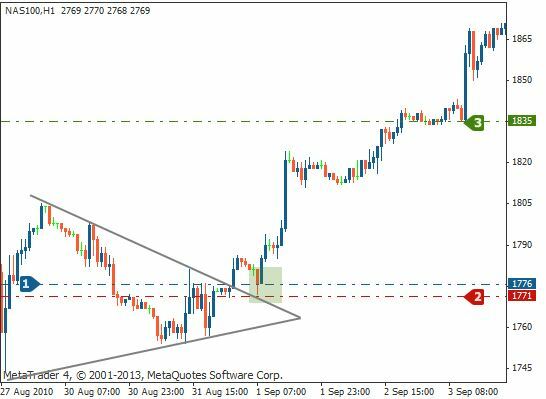 The take profit is placed the same distance away from the entry as the height of the back of the triangle. you can also trade using a symmetrical triangle by waiting for the price to come back and then place a trade once the price has found support (in the case of a long trade) or resistance (in the case of a short trade). The stop loss would go above, or below, the resistance or support levels respectively. 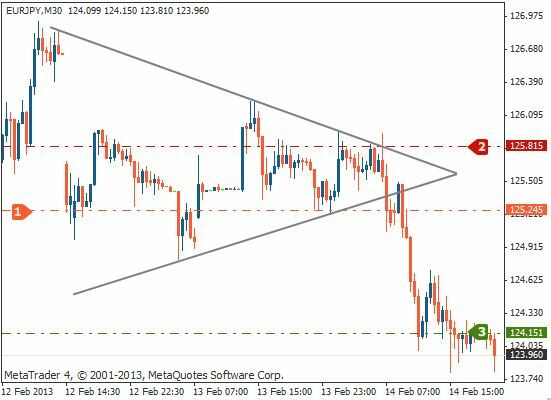 The profit target would be placed the same distance away from the entry as the height of the back of the triangle.